Contrary to how thrilled (not) Mudpie looks, we really do love our vet!!! I'm sure I'm not alone in this, but one of my greatest fears in life is going to the doctor. Thankfully I've tended to be a pretty healthy person and have made use of my local immediate care whenever something has popped up, but as the years pass by I know I won't always be so lucky. As the big 4-0 looms next year I think about all the preventive screenings that the experts say you should start having and I can't help but shudder. Routine check-ups are just as important for our cats as they are for humans, especially since they age so much faster than we do. When our pets are young and healthy, visiting the vet might not be something we put at the top of our "To Do" list. I think for cat owners especially it's particularly easy to put on the back burner because it's such a hassle to get our little furry homebodies into the car and then brace ourselves as they sing the song of their people (loudly) all the way to the vet's office. Still, consistent vet check-ups are vital for your pets to keep them healthy and happy for life. The American Association of Feline Practitioners (AAFP) has been using the entire month of August to educate cat caregivers on the importance of routine check-ups. 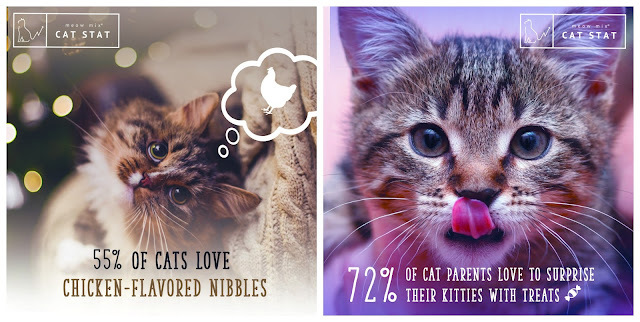 Eighty-three percent of cats are taken to the vet in the first year of ownership, yet over half of them don't return! 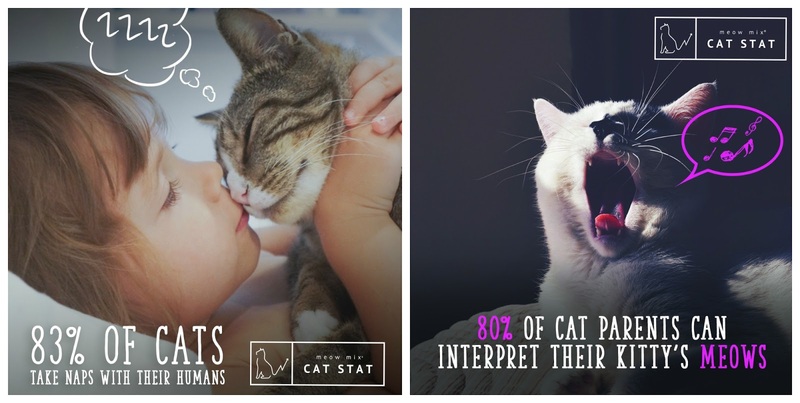 That's a scary statistic given the fact that routine check-ups allow your veterinarian to detect conditions that may affect your cat’s health long before they become significant so they can be managed or cured before they become painful or more costly. Check-ups also allow your vet to get to know your pets, making it easier to detect any changes in their health and behavior. Cats are notorious for masking signs of illness, so a vet's trained eye is needed. Screening tests such as chemistry panels and urinalysis are some of the most important parts of a wellness visit, not only as your pet ages but in your cat's earlier years too in order to provide a baseline of what's normal for your cat. 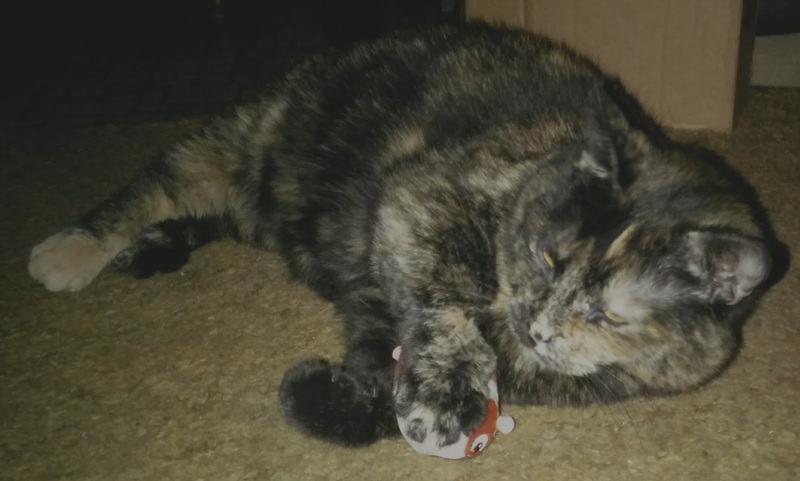 All of my cats up until Truffles were older when I adopted them, so although they had regular blood work done, I didn't have anything to compare them to from when they were young and healthy. 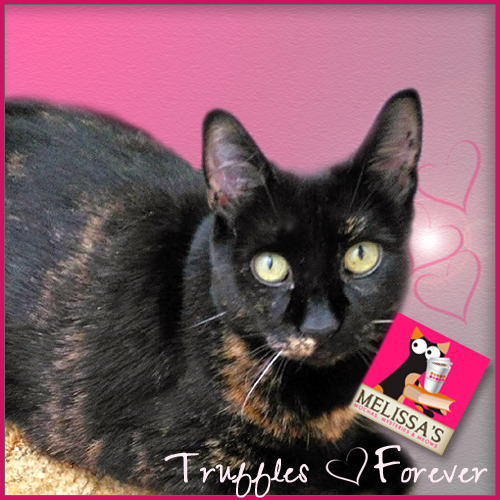 I had planned to have Truffles' first blood work done around age 5, sadly she didn't live to see that age. My plans are the same for Mudpie...we actually might even begin testing earlier in her case because circumstances have led me to become hyper-vigilant (some might say paranoid) about my cat's health. 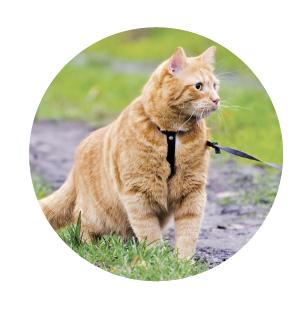 If cats have been a part of your life for any length of time chances are good you're familiar with feline kidney disease. Kidney disease is a leading cause of death for cats, just as heart disease is for humans. Over 1 in 3 cats are likely to develop kidney disease in their lifetime, and as they age the likelihood of developing it increases. In fact, more than half of cats over 15 are afflicted. 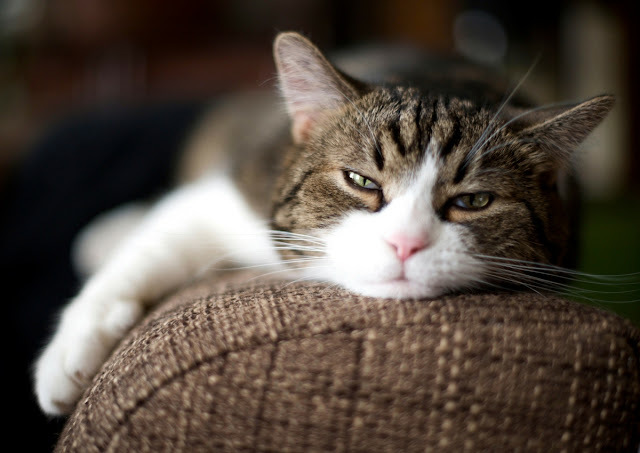 Since cats hide illness so well they typically show no symptoms (such as drinking and urinating more than normal) until their kidneys have lost most of their function - permanently. 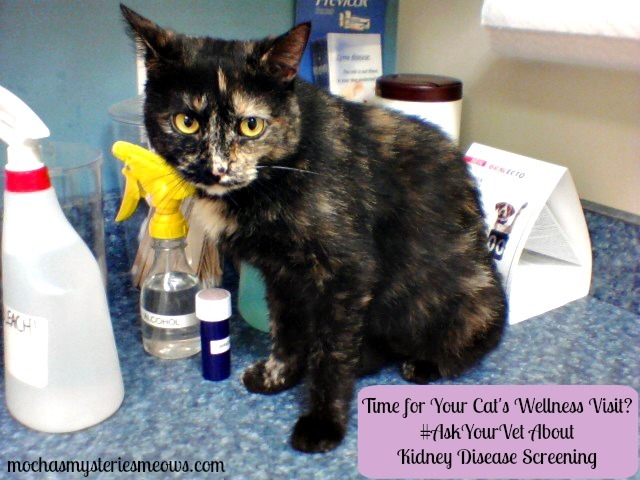 Ask your veterinarian for the IDEXX SDMA™ kidney screening test at your next appointment! 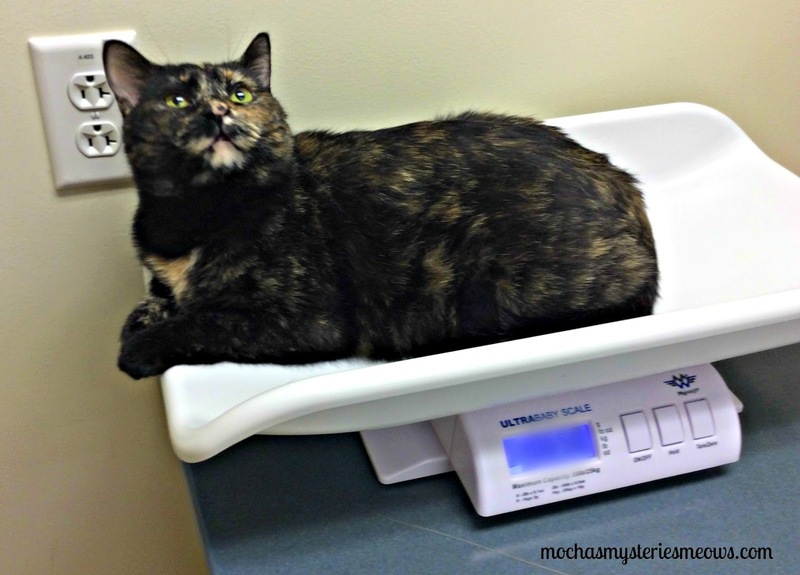 Do you take your cat to the vet for regular wellness visits? From the publisher: The elevator won’t go to the tenth floor, someone is breaking into condos, and the well-heeled Ukrainian renter isn’t paying the rent. Beth and Arnie have retired to the building where Beth’s last rental unit is located, and Beth, the klutzy landlady, has declared herself through solving mysteries. Then, her renter is arrested for the murder of the neighbor who fell (was pushed?) from the tenth-story balcony and the dead neighbor’s grandchildren are left with only their wheelchair-ridden grandmother to care for them. Beth feels compelled to help out.Are Sylvester’s psycho-cat behaviors providing clues? Is the renter actually the killer? Do the break-ins and elevator problem have anything to do with the murder? Even Arnie, who has always told Beth to keep her nose out of police business, gets involved—for the sake of the children. Welcome Sylvester! 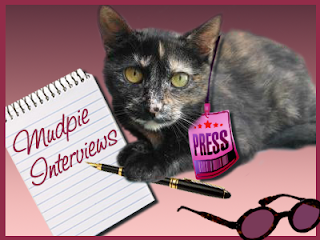 Angel Truffles interviewed you last summer but I hope you don't mind taking time out of your busy schedule to chat with me too. I understand there have been some changes to your living arrangements in the past year? Can you tell us a little about that and what those changes have meant for you? Living at the top of a ten-story building—what could be more fun for a cat? Unless it was living in a tree house. I’m an indoor cat, though, and probably a little too spoiled to live outdoors all year. One thing I enjoy here that I didn’t get to do when we lived in our big house is going for walks on a leash. Beth walks me around the condo building and on the Trolley Track Trail where she speed-walks for exercise. I reap the benefit. Beth is the landlady of a rental unit in our condo building. I’ve met her tenants. Hélène is from Paris and speaks to me with a wonderful French accent. Her toddler daughter, Fabienne, is learning to speak three languages—French from her mother, Ukrainian from her father, and English. My little friend, Fabienne, and I are pushed in our own strollers on the trail when we get tired of walking. 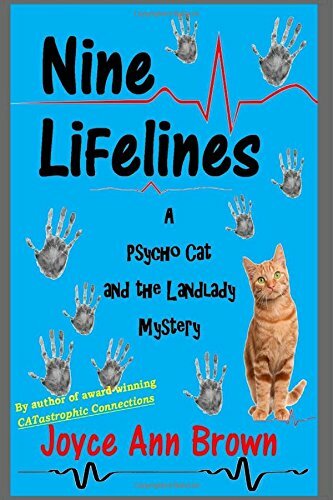 Give us the scoop on your new book, Nine LiFelines...and do you lend a paw in Beth's investigation? The minute we move into our new condo on the tenth floor of the building where Beth is a landlady for a different unit, Beth and Arnie discover some strange things going on in the building. The elevator won’t go directly to the tenth floor, someone is breaking into condos just to steal some small items such as rubber bands or paper coasters, and Beth’s renter is slow with rent payments even though he makes good money. Then, the neighbor across the hall falls from his tenth-story balcony, and the police call it a homicide. All the evidence points to the Beth’s tenant. He’s arrested, and Beth tries to prove his innocence for the sake of his wife and child. She also wants to help the family of the murdered man. Of course, I help by scratching out clues. In this book you spend a lot of time with kids...how do you feel about the little rugrats? I was shy of Beth and Arnie’s grandchildren when they first started crawling. It was only because they grabbed at my tail and hit, rather than stroked, my fur. Back then, I hid away in a bedroom or under the sofa whenever they visited. Now, they have grown into small humans, and I relate to them as such. Fabienne, my toddler stroller buddy, is still young, but I care about her, especially, and consider her a person to be protected. 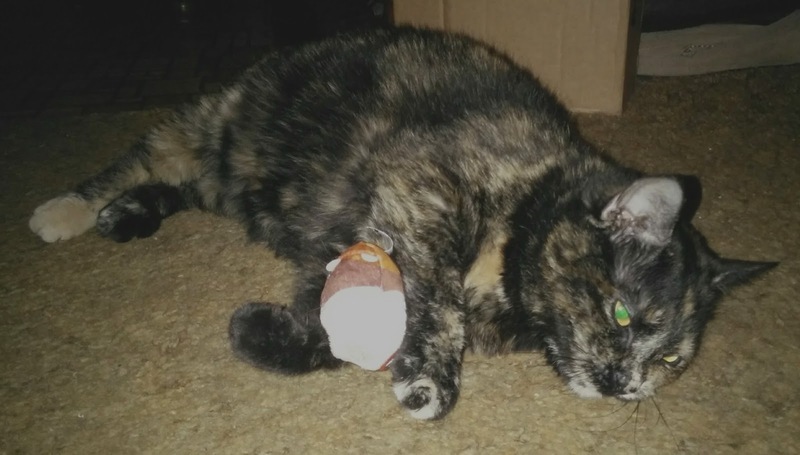 Is your character based in any way on your author's two kitties, Moose and Chloe? 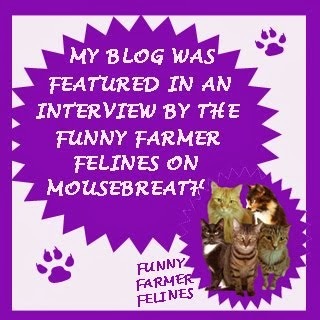 Moose and Chloe act cat-like crazy sometimes, and Joyce Ann Brown uses that behavior in her stories. She has been other cats’ human, too, and her relatives and friends have cats. She hears all the stories. 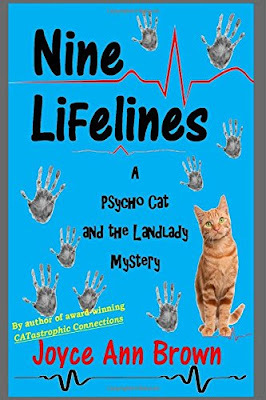 In the first book of the Psycho Cat and the Landlady Mystery series, CATastrophic Connections, my character was based on a story my author heard from a good friend about a psycho cat who saved her mistress from an attacker. After their adventures in the third book in the series, Nine LiFelines, Beth’s husband, Arnie, said that now they’ve retired from their careers, Beth should retire from solving mysteries. She agreed. I’m getting up there in years, too. But… Beth’s mother, Olive, moved into a retirement community, and we’ve been going over there to visit her. A couple of times, we saw a rough-looking, red-faced man coming out of the apartment next door, and Olive told us he was her neighbor’s son-in-law. Through the wall, she hears him yelling. I noticed that frown of concern on Beth’s face. I wonder if she’s thinking about looking into the situation—sleuthing. Actually, I may have felt a guttural growl escape from my throat at the sight of the big ape. Keep watching for updates. 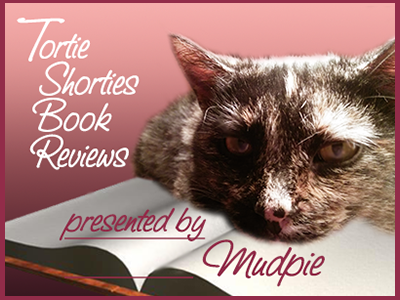 Tortie Shorties Review: This is the first book I've read in Joyce Ann Brown's Psycho Cat and the Landlady Mystery series, and the crime-solving duo of Beth and Sylvester didn't disappoint! Beth and her husband Arnie have moved into the building where their rental unit is located, and while they're looking forward to a carefree summer with their grandchildren visiting, they can't ignore the strange goings on in their new home, not the least of which is their mysterious neighbors in the penthouse across the hall. Beth and Arnie have never met their new neighbors, but when a man falls (or was pushed?) off his 10th story balcony, Beth decides to bring food over and express her condolences. What she finds is a Spanish-speaking lady in a wheelchair and two young children who have been forced to lead a very sheltered existence. Beth attempts to befriend the family by introducing the kids to her grandchildren and in the process learns all about the tragic lives they've been forced to lead. When Beth's tenants downstairs (who are falling behind in their rent payments) get caught up in the mystery, she ends up in a very sticky situation. 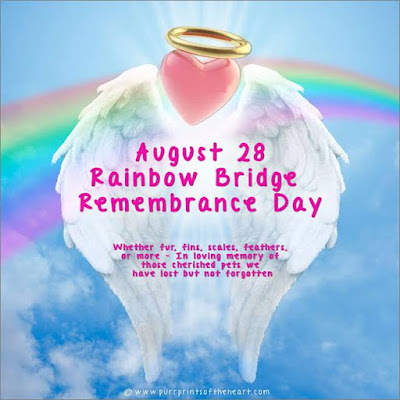 Mommy has been giving a lot of thought to what she wanted to do for Rainbow Bridge Remembrance Day. After all, we honored the anniversary of the day Tara and Truffles got their angel wings just last month, as well as what would have been Truffles' 3rd Gotcha Day last week. I decided to ask Mommy how she felt about me writing our post this year. At first she hesitated. She said I'm a baby and she doesn't want me thinking about such things as death and dying, but I insisted. There are some things I need to tell Truffles, things I want to make sure she knows, so I wrote her a poem. 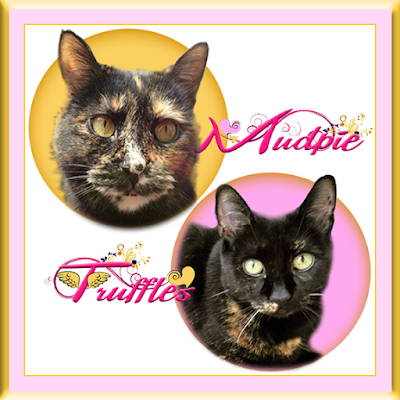 We're also entering our beautiful Mudpie and Truffles graphic, created by Ann at Zoolatry, in the Sunday Selfies blog hop hosted by The Cat on My Head. And that's not all! You need a classy painting to go with that classy meal. On the Purrfect Together portal, you can enjoy the unique experience of converting a photo of you and your cat into a Meowsterpiece—a digital "oil" painting that helps express and immortalize your cat-love on canvas. 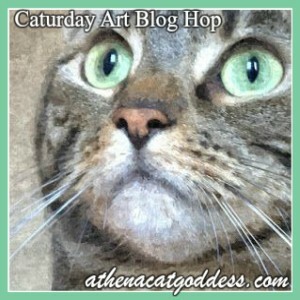 We're entering a couple of our Mudpie Meowsterpieces in this week's Caturday Art hop! Disclosure: This post is sponsored by Meow Mix, which means that we were compensated to feature this content. Featured Cat Lady Artist Robin Wethe Altman: Vivid watercolor of a kitty by a beach house. Can't you just hear the waves crashing? Another Day in Purradise Tank Top (CatLadyBox exclusive): With as many t-shirts as I have in my collection I think this is my first tank top! Love the quote...every day we have with our cats is another day in purradise! Shady Cat Beach Towel (CatLadyBox exclusive): Whether you use this at the beach or as a bath towel, this is the cutest beach towel you're likely to ever find. The art card has a really good idea of using it to cover a cat carrier during car rides! I'm thinking I might use it as an extra blanket on the bed when the weather gets chillier. Silver Cat Clip Bookmark Set (CatLadyBox Limited Edition): Cats and books, that's what life is all about, right? At least it is at our house! I'd never used a clip-on bookmark before but I've been using these ever since they arrived and I'm just crazy about them! 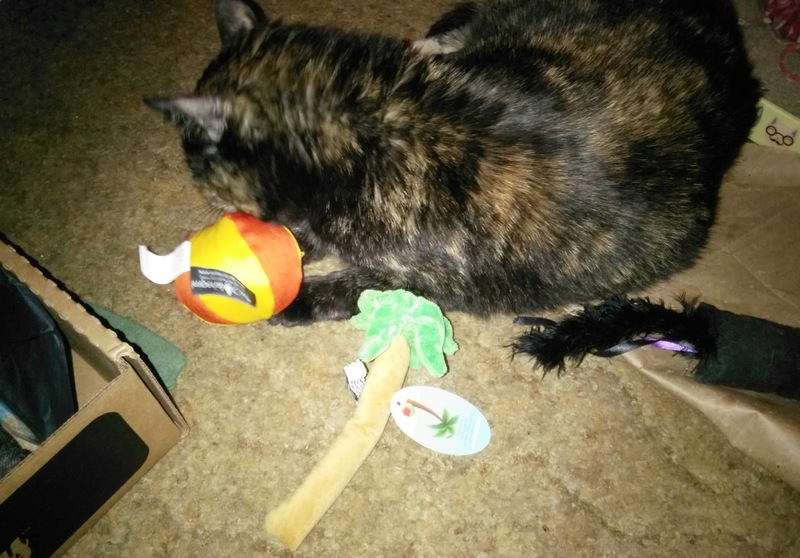 Tropical Lip Balm (CatLadyBox Swag): I couldn't live without lip balm. Love being able to advertise CLB when I whip it out of my purse! Disclosure: I'm not being compensated for this review. 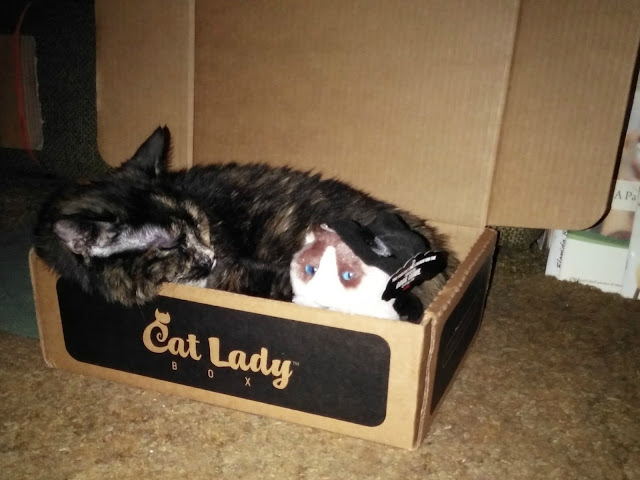 I am a proud CatLadyBox subscriber! From the publisher: Beatrice Young almost died and no one's seen her since. So when a 500-pound Siberian tiger is stolen from a roadside attraction near the small town of Ashbrook, New Hampshire, it's up to her trusty friends Matthew and the sheriff to solve the case. The plot thickens as the men discover the controversy surrounding Omar the tiger—the animal rights activists who want to free him, the owner who wants to keep him, and maybe even the exotic animal traders who want to sell him. Ever since a brush with death in the previous book in the series, The Paw-sitively Cheerful Poisoner, Beatrice has been AWOL and the men in her life are getting antsy. Then Sheriff Jacob Roy and Beatrice's ex Matthew (a park ranger) receive a call about a tiger stolen from a roadside attraction. When Beatrice is finally convinced to come back home and race reality she receives a frantic call from the sheriff asking her to pick up a tranquilizer gun on the way. Jacob and Matthew have found themselves in a pretty hairy situation and it's up to Beatrice and her beloved felines to save the day. 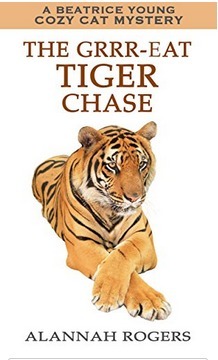 The Grrr-eat Tiger Chase can be downloaded to your Kindle today! 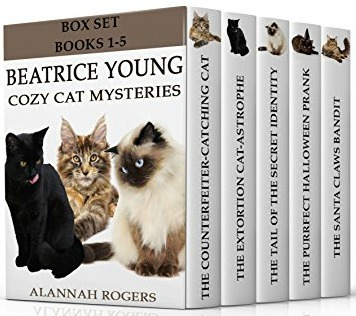 And if you haven't been with Beatrice from the very beginning, author Alannah Rogers is offering our readers a pawsome giveaway! One lucky winner (open worldwide!) will receive an e-book box set of the first 5 books in the series! 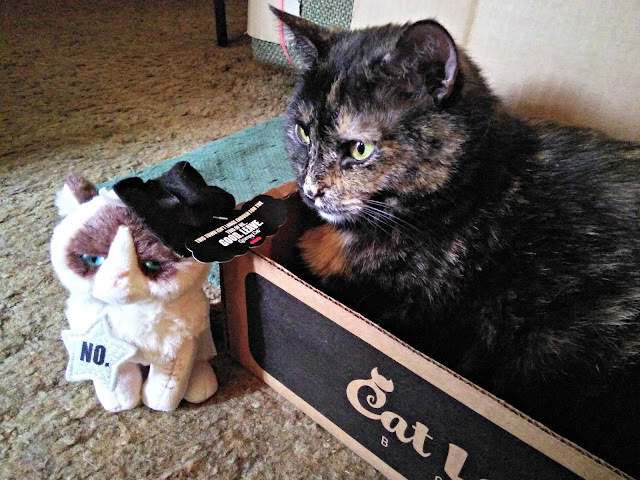 It's no secret how much Mommy loves Grumpy Cat, and she's always on the lookout for new GC stuffies to add to her collection. Browsing Amazon the other day she stumbled upon Miss Grump as an Old West Sheriff and couldn't click on Buy It Now fast enough. Can you see the tag? It says, "This town isn't large enough for the two of us...Good. Leave." Right after this picture was taken I grabbed Grumpy by the ear and started biting her. Whaddya mean this toy isn't for me, Mommy??? 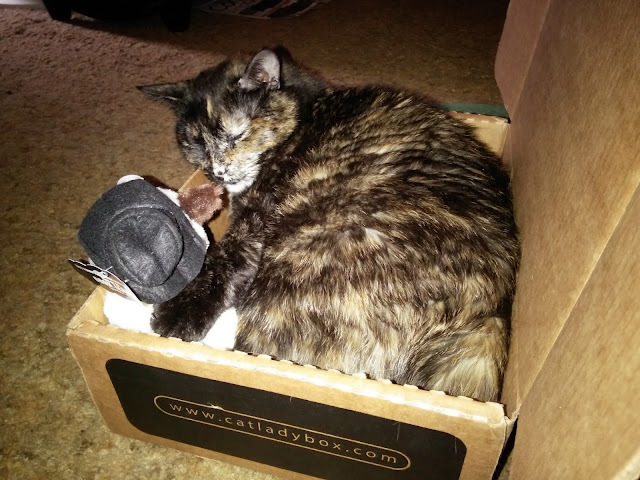 I was told I could only play with her if I was gentle and Mommy put her in the box with me...so we decided to take a nap. Then I made Mommy swoon (it's really not that hard to do) when she noticed that I had my arm around Grumpy. Looks like Miss Mudpie nabbed the sheriff instead of the other way around! Don't I look like I'm drooling??? Mommy is starting to notice a pattern with me. I'm much less fussy when wet food comes in a tray or a pouch then when it comes in a can. Is there some strange taste lingering in canned food that only my discriminating palate can detect? Who knows. I think it's just because more yummy gravy can usually be found inside those pouches! 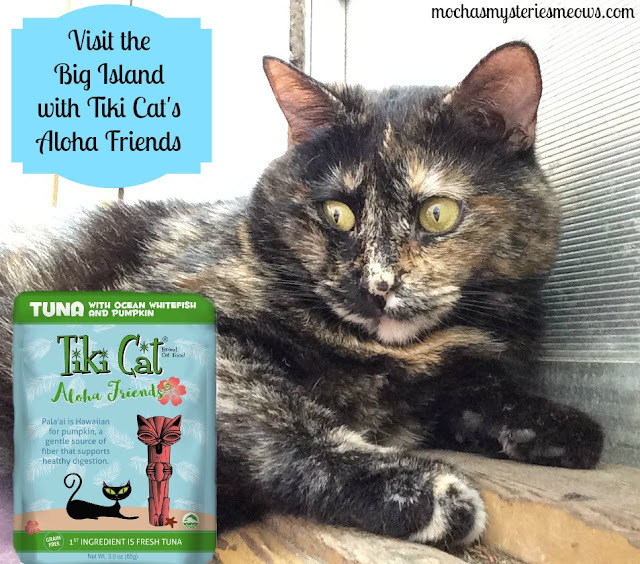 Thanks to Chewy.com I got to try Tiki Cat's new Aloha Friends pouches, which comes in 4 flavors: tuna with ocean whitefish, tuna with tilapia, tuna with shrimp, and tuna with calamari. 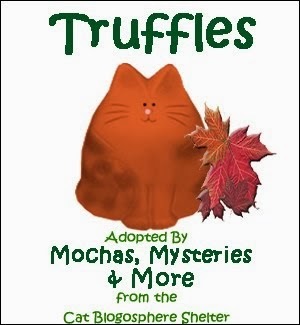 Each flavor also contains pumpkin which is really good for kitty tummies. I chose the tuna with ocean whitefish because those are flavors I've liked in the past in other foods I've tried. Of course Mommy oohed and aahed over how adorable the packaging is. She's so silly. It's what's *inside* that matters, Mommy!!! When you open the package it smells just like an open can of tuna fish. You could almost serve it on a cracker to your family and no one would suspect that it's cat food! Tiki Cat Aloha Friends pouches are currently available on Chewy.com for only $10.16 for a case of 12. There's even a variety pack so you can try out all 4 flavors, so ask your mom or dad to add some to your next Chewy.com order. 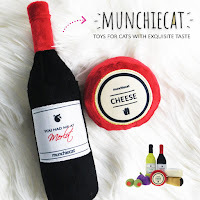 They offer FREE 1-2 day shipping for orders over $49, and with over 500 brands in stock they have something sure to make every cat or dog happy. Welcome, Buckley and Bogey! Thank you so much for chatting with me today. Could you start by telling us a little about yourselves and how you came to live with your humans? Buckley: Thank you, Miss Mudpie, for having us here today. As two working cats to another, we want you to know, we sure appreciate all that you do! You’ve done a lot to promote the rescue, adoption, and care of cats. Bogey and I are both former shelter cats, and well, we can’t even begin to tell you how much your work means to us. Thanks to the efforts of you and your Mom, guys like us end up with a very happy home! Bogey: That’s right. You’re a swell dame, Miss Mudpie. You’ve got both beauty and brains. My kinda gal. Anyway, to answer your question, I’ll get the ball rolling since I’m older and got here first. Years back, our Mom and Dad saw me at the Humane Society Shelter on the last day in October when they could legally adopt a black cat. I won’t even go into “why” shelters can’t adopt out black cats later in October. That’s a very bad business. Anyway, I came from a litter of six brothers; all of us boys were black kittens and raised to have good manners. My human Mom and Dad named me Bogart, after Humphrey Bogart. They call me Bogey for short. If you ask me, I think it’s a pretty good name. At the shelter, I was born in a cage and lived my first few months in a cage. I didn’t know anything different until my new Mom and Dad stopped by and adopted me. But the minute we got in the car, I saw what I’d been missing. Who knew there was a whole big world out there? I was so excited I couldn’t stop looking at everything. 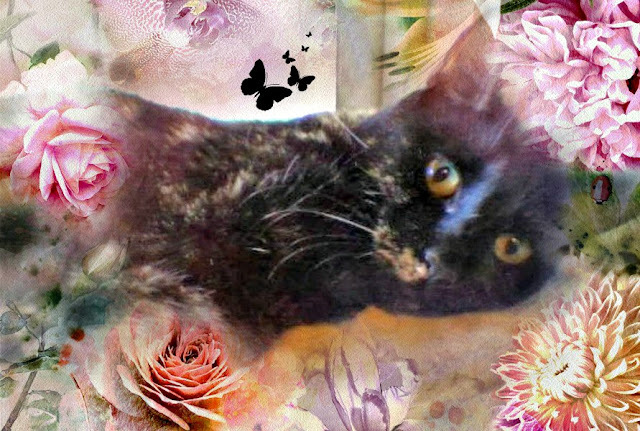 Then, when I got set up in what my Mom calls “the kitten introduction room” at home, away from the other cats, well, I started running and running and running. I’d never seen so much space before in my life! I ran from my Mom to my Dad and back again. It was so much fun I couldn’t stop running. Not till I was good and worn out. 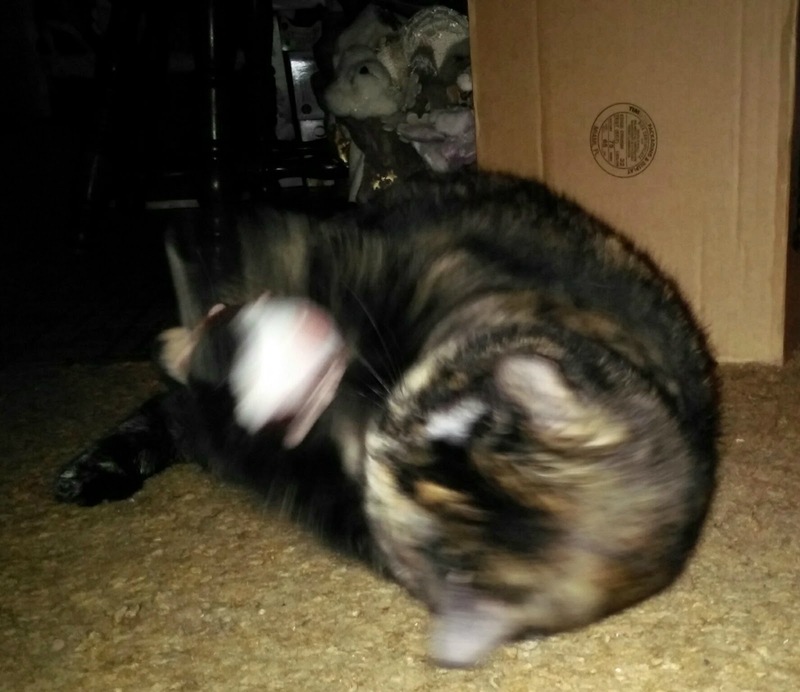 Later that night, one of the older cats, Lil Bits, came by and sniffed under the door. We had a long chat and she told me all about being a cat detective. Well, I knew right then and there that I wanted to be a cat detective more than anything. So I studied and practiced and worked hard to be at the top of my field. The only problem was, Lil wanted to retire, and the other girl cats in the house didn’t care about detective work. Yet most great cat detectives have a partner, someone to back them up when a situation gets hairy. And here I was, all by my lonesome. So I started bugging my Mom about adding a little brother to the family. Someone who could help me start an agency. You want to take it from here, kid? Once I got home, I was settled into that “introduction” room, too. But my new big brother was there right away, sticking his paw under the door. Of course, I made a beeline for my side of the door to meet him. That night we had a big talk about me becoming a cat detective, and of course, I agreed. The next day, our Mom let Bogey in with me, and five minutes later, we were best friends and we’ve been inseparable ever since. Right away he took me under his paw and taught me everything he knows about the cat detective business. I could hardly believe how blessed I was. In a matter of a few months, I’d gone from being on Death Row to having a home and a family and a job. And most importantly, my big brother, Bogey. Please introduce us to your wonderful mystery series! 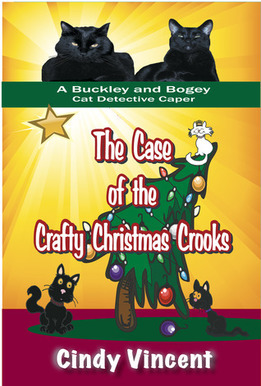 Bogey: Well, once we started the BBCDA, the Buckley and Bogey Cat Detective Agency, and advertised it on the Internet, the cases started pouring in. Seems there weren’t enough cat detectives out there for all the cases that needed to be solved. Business was pretty good, and we helped lots of other cats who were in trouble. But we had plenty of situations that involved humans, too, which was sort of funny, considering the humans had no idea we were even on the job. Though some of those closest to us started to pick up on a few things. Eventually, Buckley got the idea to write some of these cases down. While he may be a rookie when it comes to being a cat detective, it turns out he’s a pretty good writer. So that’s how the Buckley and Bogey Cat Detective Capers got started. So far he’s put four of our most interesting mysteries to paper. You want to take it from here, kid? Buckley: (Nodding.) Sure thing. I started with our first big case, The Case of the Cat Show Princess. That one was a real doozie! Bogey and I had to go undercover at a cat show to rescue another cat and catch a couple of crooks. Bogey entered the “Agility Competition” and I landed in the “Cutest Family Pet” category. Boy, oh boy, I sure hope we never have to do something like that again! Bogey: You and me both, kid. You and me both. 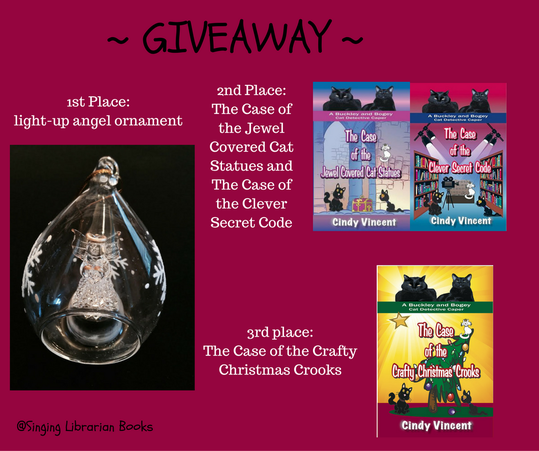 Next came our Christmas story, The Case of the Crafty Christmas Crooks, on blog tour now. That was the case where some burglars were breaking into houses and stealing Christmas presents. All around our little town of St. Gertrude. Buckley: Holy Mackerel, was that ever scary! Especially when they came right to our door! After that book, we put out the Case of the Jewel Covered Cat Statues. I’m still sort of dazzled by all the sparkly gems we saw on that case. But we also learned about Danby Daunton and a 150-year-old mystery. On top of that, we ran into some really nasty bad guys. Bogey: And a dame or two. But our last case was probably our most difficult ever. The Case of the Clever Secret Code. It really had us on our paws. Between handling a Hollywood movie star who suddenly showed up in St. Gertrude, to solving an old secret code, and learning lots and lots about the Declaration of Independence, well . 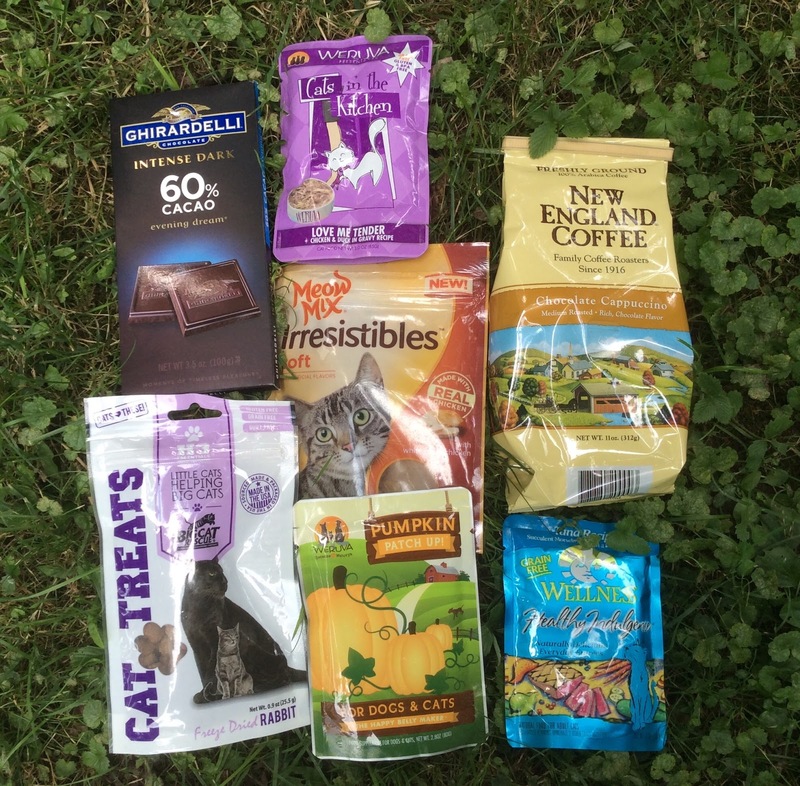 . . let me just say that I needed more than a few bags of cat treats to get through that one. Buckley: Uh-huh. Especially after we drove that exercise wheel down the street to rescue a cat who’d been cat-napped. But we did get to ride on a float in the Fourth of July parade. That was fun. Bogey: Good times, kid. Good times. Anyway, Miss Mudpie and her audience can probably see why we wanted to put our adventures down for others to read. Because we’ve had some good ones! 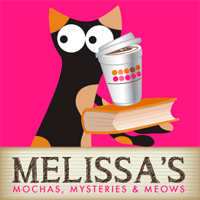 What's life like as crime-solving kitties? Bogey: It’s great. Every day is a new adventure. You just never know where a new case is going to take us. We always have to think on our paws, and a guy can’t beat that. And sure, we come across some pretty nasty specimens at times, but we always outsmart them. And dames really dig a guy with cat detective credentials. Buckley: Uh-huh, it’s great, all right. But it can be very, very scary. And I do mean scary! It doesn’t help that I’m still a rookie. Thankfully, Bogey is the pro. But we also have a cat in our house that we call “The Wise One.” This cat is so old you might even say she’s ancient. Because she’s so old, she’s seen it all and she knows lots of things about, well . . . pretty much everything. So whenever we hit a rough spot, we like to go to her for advice. And by saying “we,” I guess I mostly mean “I.” Still, I sure hope to be as wise as she is someday. Plus I hope I can be as good a cat detective as Bogey is. Bogey: Don’t sweat it, kid. Have a couple of cat treats. This’ll calm your nerves. Remember, everyone’s got to start somewhere. And look how far you’ve come in the years since we opened the BBCDA. You’ve learned tons. And sure, we’ve been in some tight spots. But remember, cats are better at solving crimes than humans. After all, we can see in the dark, sniff out the bad guys, and we’re aces on the computer at night. Buckley: (munching) Thanks. Whew . . . I needed those. I do have to say, I really like helping people and cats who need us. That feels pretty nice to me. There’s nothing like rescuing a cat from a bad situation, or catching some mean crooks so they can’t cause trouble for someone else. And we also help homeless cats find homes. So, all in all, I really like being a cat detective. Even if this job can be scary. Very scary. Bogey: The humans in the family tell me I need to lay off the cat treats a little, that I might be overdoing it a little. So I just keep cat treats stashed all over the house, in our Mom’s car, at her antique store, and well, pretty much everywhere I can think of. I find a few cat treats helps me think, and calms me down when I’m under pressure. Buckley: I like cat treats, too. But I usually rely on Bogey to give me some. They really are a great pick-me-up. Sometimes I even have dreams about cat treats. Bogey: As for toys and beds, well, we have beds at home and at our Mom’s antique store. But as cat detectives, we don’t get time for as many naps as we’d like. So we try to grab a little shuteye when we can. Mostly though, us working cats have always gotta work! Buckley: Holy Catnip! You can say that again. We usually run surveillance rounds at night. Plus we also have some cat towers that give us a great view of a couple of rooms and are perfect for surveillance. It’s a tough job, but we’re up for it! The book we're featuring today is a Christmas mystery. 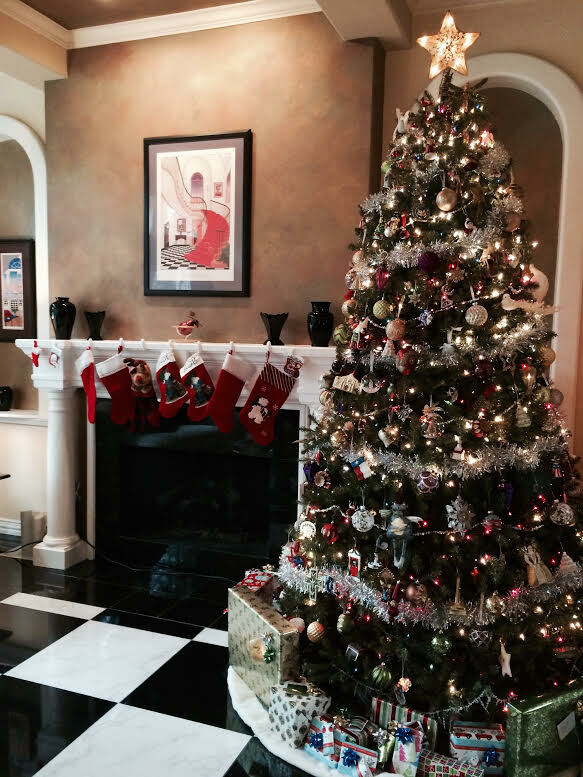 What's your favorite part of the holiday season? Buckley: Holy Mackerel! I think I’ll take this one. At first I was really scared when our Mom started dragging out all those decorations. But then Bogey explained everything to me, and I actually started to enjoy Christmas. Now, I have to say, there are just so many things I like about the holiday. The trees, the lights, the decorations. And all the food. Wow, it’s almost more than a cat can take in. Not to mention, I was pretty excited at first when I heard we were going to get presents. After all, a boy can’t have too many toys, can he? But then I realized the cats at the shelter weren’t going to be getting any presents at all, and I thought that was pretty sad. So Bogey and I found a way to take all our old toys to them, and give them a real Christmas. The funny thing was, that’s what made me the happiest. Getting presents myself was nice, but it was giving to others that really touched me. Bogey said it was the “Christmas Spirit” that I was feeling. It’s kind of funny how that works. Then finally, what I liked the very, very best of all about Christmas, was having friends and family and all our cats around me. That made it special. 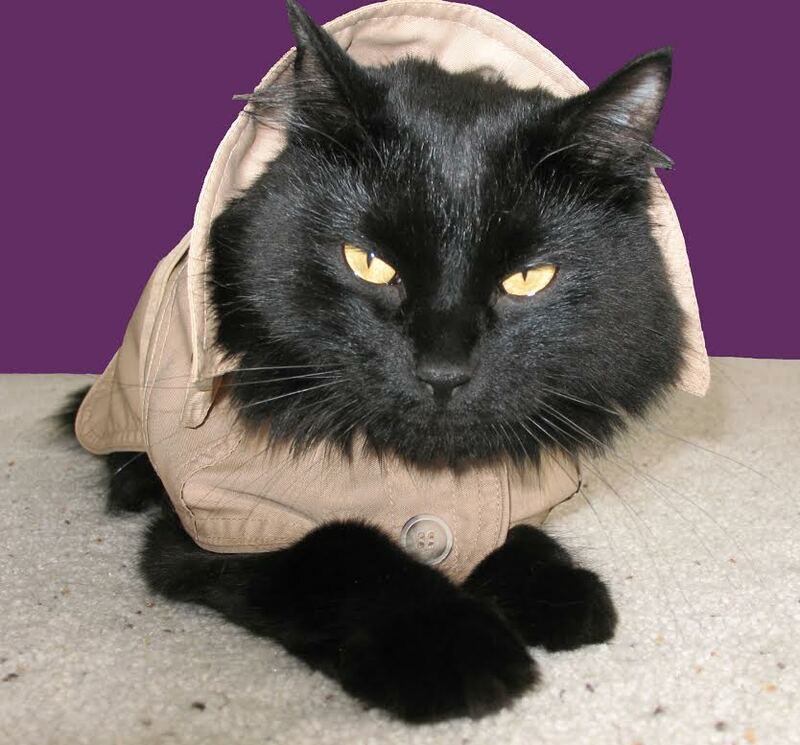 Lastly, what advice would you give to cats who would like to be a detective just like you? Buckley: I’m going to let my big brother handle this one. Since he took me under his paw and taught me everything he knows, when it comes to the cat detective business. Bogey: Thanks, kid. I’ve been in this business for a while now, and I’ve seen things I never thought I’d see. Some things that weren’t pretty, and other things that were so wonderful they could melt a guy’s heart. But if there’s one thing I’ve learned, it’s that every cat has their own gifts and talents. Humans, too. And whatever the good Lord gave you is what you’ve gotta use. Develop it and work on it, until you become a pro like me. And if you figure out that being a cat detective is your line of work, well, then give it all you’ve got. Keep learning and working until you get to be really good at it. It’s not easy, but it’s worth it. I couldn’t imagine doing anything else. Buckley: Me, either. And now, we’d like to thank you again, Miss Mudpie, for having us here today. It’s been lots of fun to talk to you, and we count you as one of our friends. Keep up the good work, and give your Mom a hug and kiss from us! Merry Christmas in August!! Holy Catnip! I loved the way the boys manage to venture from home to conduct their investigations, even accompanying young Gracie to the annual craft fair, leading to still more fun adventures. Each cat has his own unique personality and quirks, from Buckley's pure innocence (and ongoing battle with his huge paws) to Bogey's confidence (and stash of hidden cat treats everywhere) - they are just too cute for words. The final chapter, as Buckley learns the true meaning of Christmas, is one of the most beautiful I've ever read. I shed happy tears all the way through. Disclaimer: I received a free copy of this book as part of the Singing Librarian Books blog tour. 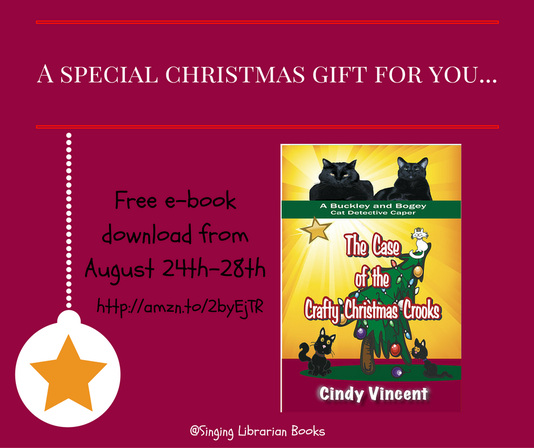 Download The Case of the Crafty Christmas Crooks for FREE!!! We're excited to be joining in this fun blog hop hosted by Miss Molly Says and Mom Does Reviews. Here's what we're giving away: several pouches of cat treats paw-picked by moi, plus coffee and chocolate for the humans! 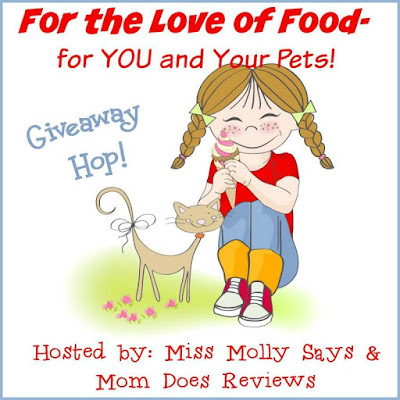 Make sure you hop along to all our fellow bloggers' giveaways too! Mommy keeps saying she doesn't think I can get any cuter...but I'm gonna keep trying! Three years ago today I brought Truffles home. She's been gone for nearly 14 months now and I still can't fathom that we didn't even get to celebrate a second Gotcha Day together, much less a third. 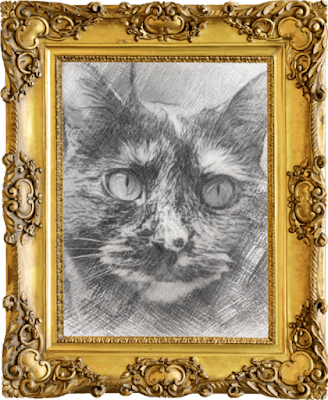 Our Caturday Art project this week is for her. For anyone who would like to participate on their blog or social media, Rainbow Bridge Remembrance Day is next Sunday, August 28th. 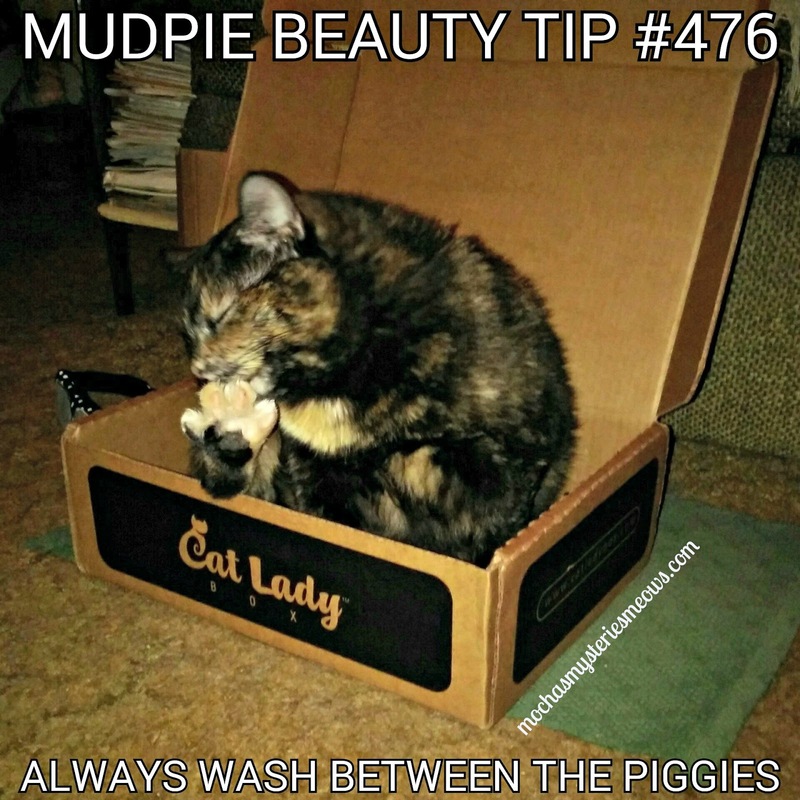 Mudpie is taking the lead with our post this year but I'm not sure what she has planned. I've told her she's not allowed to make Mommy cry. No, you haven't missed anything! 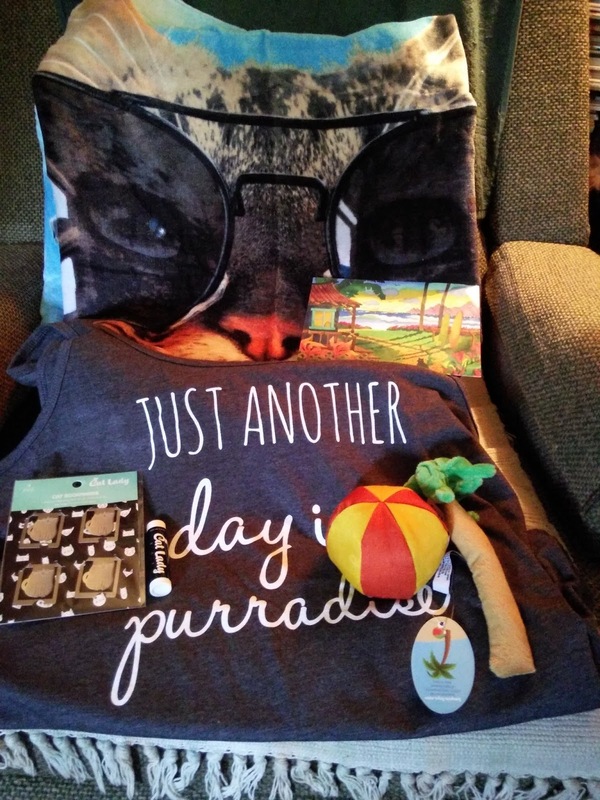 Time got away from us and we never got to post our unboxing of July's CatLadyBox, but the August box arrived last week and we loved it *so* much we just couldn't wait to show it to you. We promise to show you July's box next week! Featured Cat Lady Artist Toni Carbone: Breakfast at Tiffany's, anyone? Oh, how I love this art card! Absolutely Meowvelous Shirt (CatLadyBox exclusive): I'm thinking about clearing an entire drawer for my ever-growing collection of CatLadyBox shirts. I wish I had the words to convey how soft this shirt is! Very modern design to fit loose and drapey, yet the graphic is totally old Hollywood. 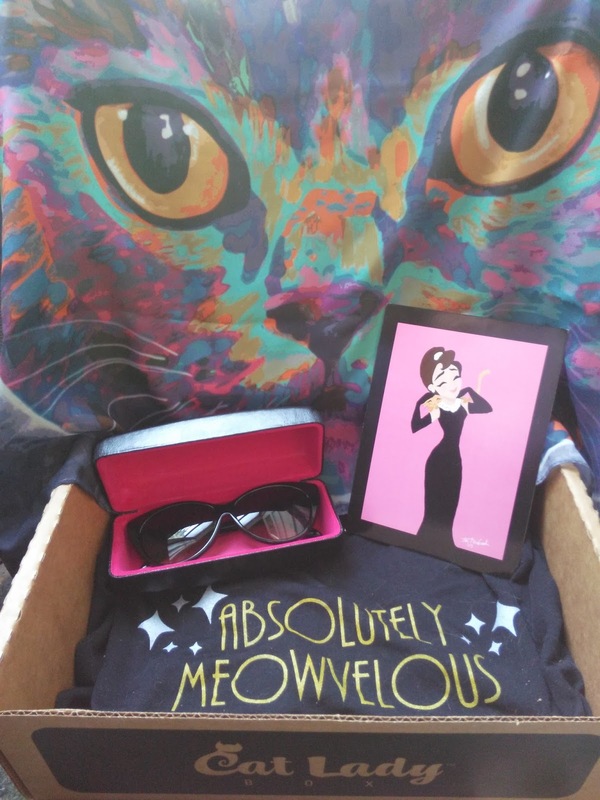 Glamour Puss Sunglasses (CatLadyBox exclusive): What a step up from the Dollar Store sunglasses I typically wear!!! These are simply out of this world, right down to the case (black w/gold CatLadyBox logo and stunning pink lining) they come in. I'm completely nuts over the cat-eye frames and silver CLB emblem on the side! Spectra Fabulous Scarf (CatLadyBox exclusive): Created by the same artist who designed the umbrella from March's box. Pair with the sunglasses for the epitome of cat lady style! 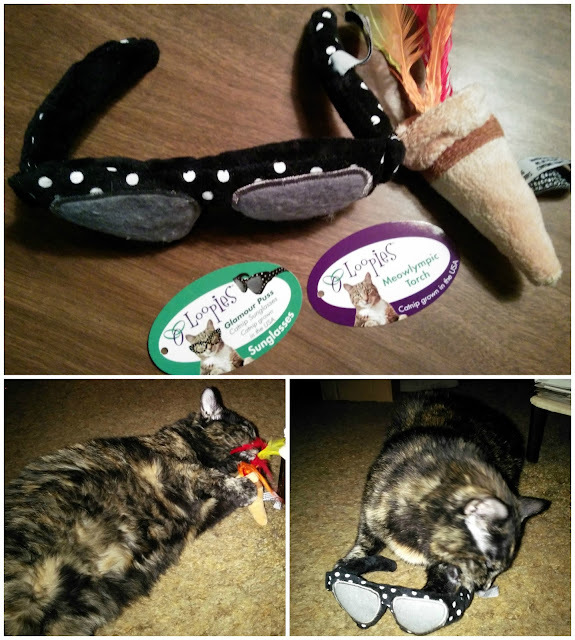 Glamour Puss Catnip Sunglasses Toy (CatLadyBox exclusive): I saw other cats on Instagram wearing their catnip sunglasses...not my Mudpie! She says toys are for playing, not making a fashion statement. Meowlympic Torch Catnip Toy (Limited Edition for CatLadyBox): We're not Olympic watchers but Mudpie has gone absolutely bonkers for this toy, most likely because of the feathers. You know, sometimes I feel sorry for you humans. Even after years and years of school you'll still never be as smart as us kitties, and we never have to step foot in a classroom! 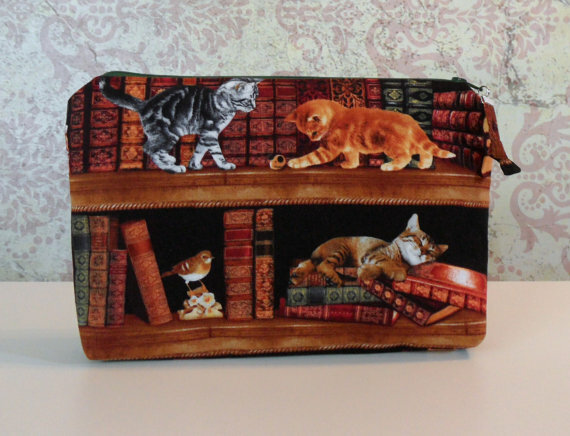 Library Cats Zipper Pouch We picked this one first because Mommy has been drooling over it ever since she saw it. She keeps reminding me she has a birthday coming up. Can anybody help a kitty out??? From BoyHowdyClothing. 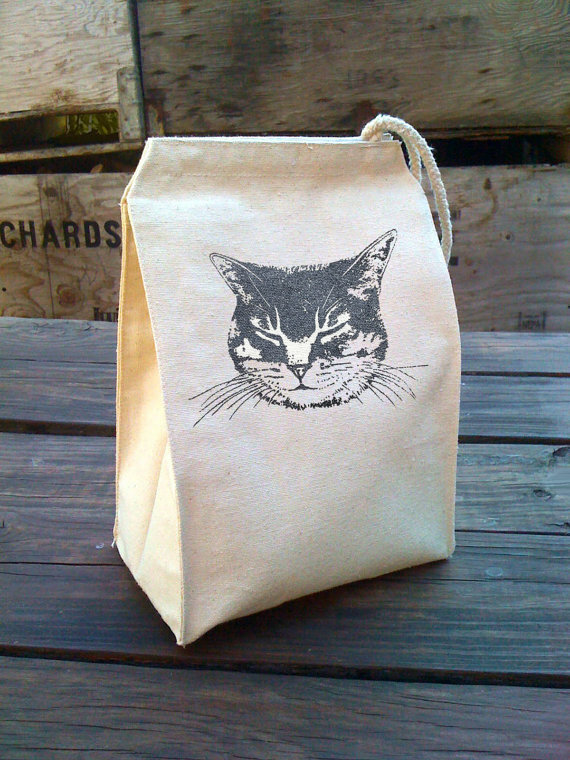 Eco Friendly Cat Lunch Bag Paper bag lunches? How boring! This cloth lunch bag is made from recycled cotton fibers making it reusable and machine washable. With a VELCRO® like closure, soft rope handle, and the ability to fold completely flat for easy storage when not using, adults could even take this bag to work or to bring snacks along on a day at the hiking trail this fall! From alittlelark. 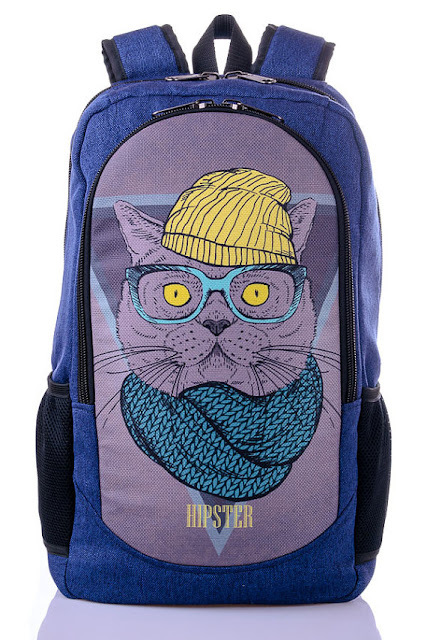 Hipster Cat Backpack Be the hippest kid in school with this backpack. 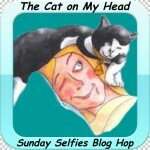 Doesn't the kitty look brainy??? The bag comes with a variety of color choices, and is purr-fect for kids of all ages! From XYZbag. 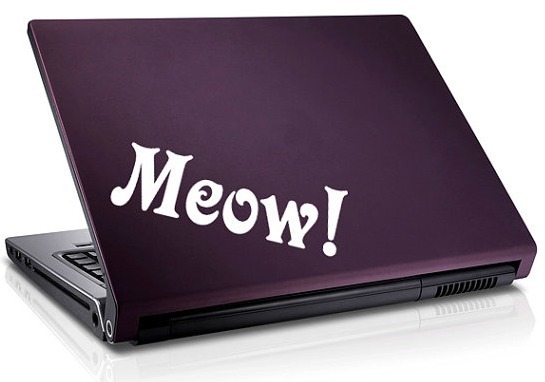 Meow Vinyl Decal Make your laptop stand out from the crowd with this cute decal, available in a variety of colors. 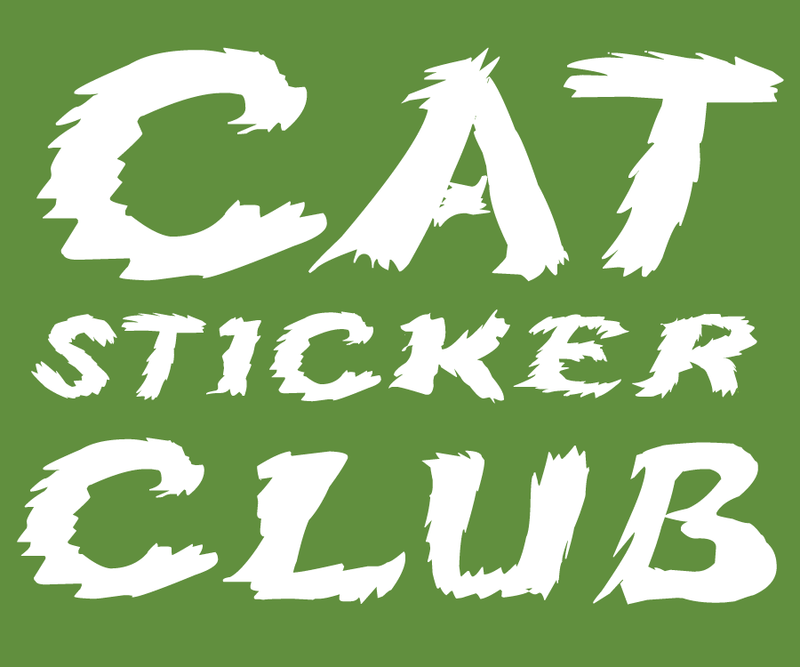 Made from automotive grade vinyl film this decal is built to last. We think it would even look super cute on a locker! From SewardStreetStudios. 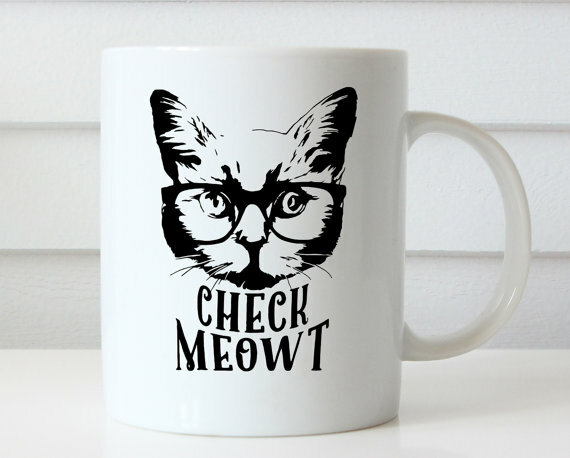 Check Meowt mug You can never have enough cat mugs, right? We have so many at our house I'm surprised my water bowl isn't a cat mug! Choose this one for all those late night study sessions that require extra coffee. From Giftsology. 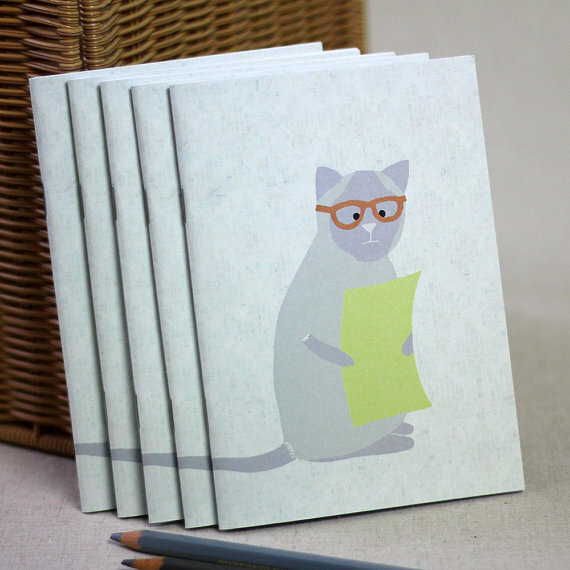 Small Cat Reading Notebook We're thinking about getting a couple of these for blogging notes, one to slip in Mommy's purse, one to keep by the bed for when an idea hits in the middle of the night. From lil3birdy. Check out loads more cute kitty school supplies here! Mommy Got Me a Guinea Pig! Remember how last week we celebrated my very first Gotcha Day? 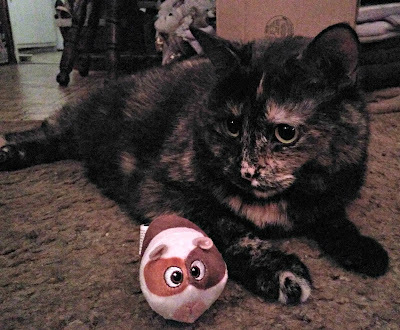 Well Mommy got me a guinea pig! Seriouslies!!! When we first met I decided to play hard to get. You know, lull him into a false sense of security. Then I started to cozy up to him. "It's ok, little guy. We're going to be BFFs!"